The University and Iddo Local Government have entered into a Gown and Town relationship that will help foster collaboration, mutual growth and expansion in the areas of capacity building and agricultural development. The partnership was reached when the Care-taker Committee Chairman of Iddo Local Government, Professor Adeniyi Olowofela, paid a courtesy visit on the Vice-Chancellor, Professor Olusola Oyewole. 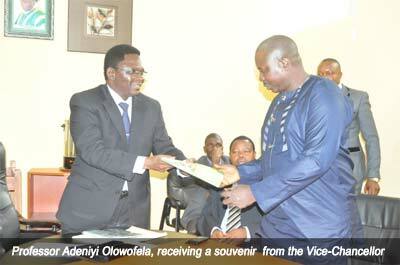 Accompanied by Executive members of his cabinet, Professor Olowofela, a member of staff of the Department of Physics in FUNAAB’s College of Natural Sciences (COLNAS), said the courtesy visit was to solicit the University’s assistance for the capacity development of the local government personnel and engage its vast arable of land for research and agricultural utilisation. Besides, the Council boss said it was also aimed at exposing his local government to “the cleanliness of FUNAAB, which is second to none and I want my local government to copy from FUNAAB as a reference point”. Responding, the Vice-Chancellor, Professor Olusola Oyewole, who received the guests alongside Principal Officers and some Directors said “We are proud of you (Professor Olowofela). I’m happy that Iddo Local Government emerged the Best in Nigeria under your Chairmanship. I want to tell you that we don’t want to lose you. Our University still needs your experience at interacting with our communities”, he said. The Vice-Chancellor observed that “being cited in Ogun State, people have the wrong impression that FUNAAB is meant to serve only Ogun State”, adding that “…we are serving the South-West States, Delta States and Nigeria at large. Your coming is an opportunity to reach out to Oyo State. Professor Oyewole called on the Chairman to give the University “the opportunity to serve Iddo Local Government” in the areas of capacity building, mounting of short term courses, research and organising retreat for Council staff. 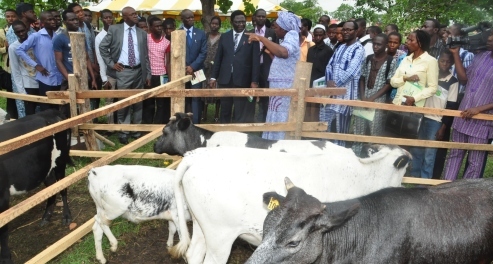 The Vice-Chancellor also sought the assistance of the local government’s the replication of the University’s Community-Based Farming Scheme (COBFAS) programme in the Council area. Earlier, the Vice-Chancellor had lauded an illustrious son of Iddo Local Government and the Deputy Vice-Chancellor, Development, Professor Kolawole Salako, for contributing immensely to the development of the University and Ogun State through COBFAS, a scheme he pioneered as its Director. Professor Olowofela later endowed the University with a leadership award for Best Productive staff at the College and Departmental level.